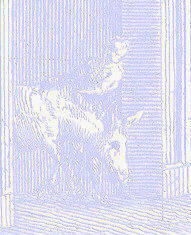 In his choice of the parish churches of Rome, Vasi is sometimes driven by his interest in sketching everyday life. The view is taken from the green dot in the small 1748 map here below. 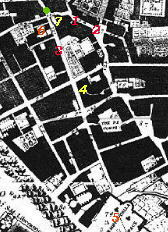 In the description below the plate Vasi made reference to: 1) Strada dei Conti; 2) Tower of Palazzo del Marchese del Grillo; 3) Strada Alessandrina; 4) Walls of Monasterio della SS. 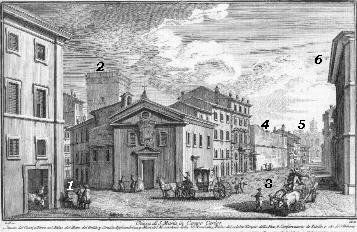 Nunziata; 5) Ruins of Tempio della Pace; 6) Conservatorio di S. Eufemia. 2), 4) and 6) are shown in detail in other pages. The small map shows also 7) S. Maria in Campo Carleo. 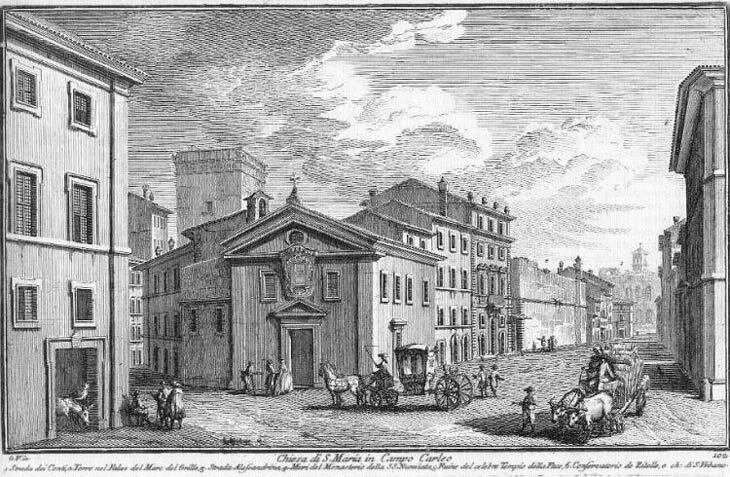 The name of Via Alessandrina (after cardinal Michele Bonelli, known as Cardinal Alessandrino who opened the street between 1567 and 1570) is the only remnant of the medieval area between Trajan's Column and the Temple of Peace (Tempio della Pace). 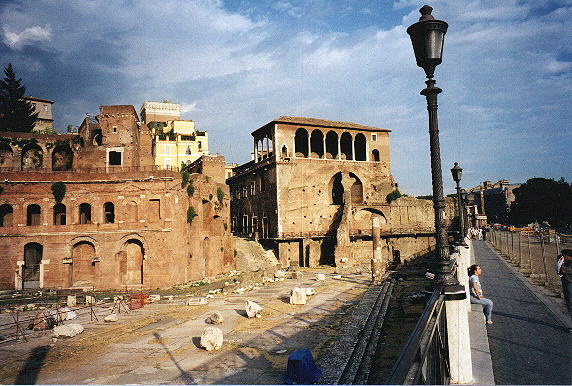 The excavations of the Imperial Fora and the desire in the 1930s to provide Rome with "imperial" avenues led to the total pulling down of an area very similar to that still existing between Via Nazionale and Via Cavour. 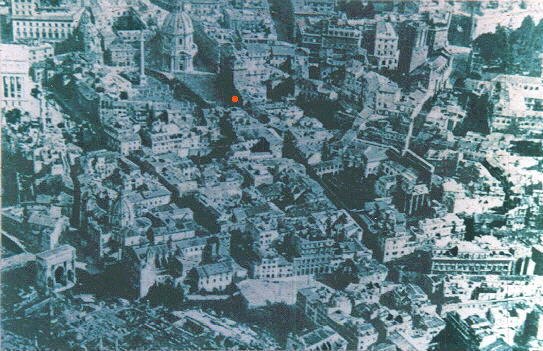 Here below an aerial view of the area: the red dot is the point from which Vasi took his view. From there in a right/down direction one can see Via Alessandrina. On the left lower corner the church of SS. Martina e Luca and the Arch of Septimius Severus. A fine Late Renaissance palace, the house of the architect Flaminio Ponzio, was rebuilt in Piazza di S. Maria in Campitelli. 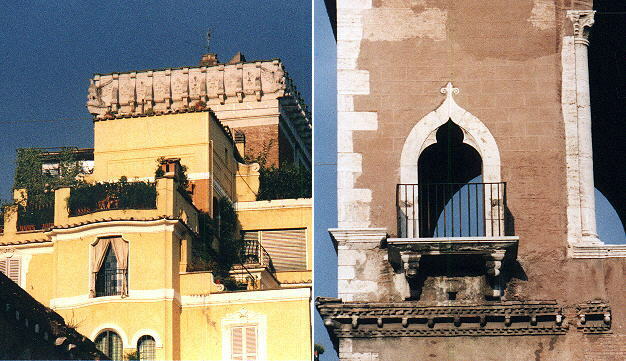 Palazzo del Marchese del Grillo (left) now directly looks over the Imperial Fora. Also an early Renaissance building (right) belonging to the Knights of Rhodes (then to become Knights of Malta) benefitted from the restoration. The fine Renaissance loggia in the first photo of this page belongs to this building. What Vasi calls Tempio della Pace is now called Basilica di Massenzio. A Tempio della Pace was erected by Vespasianus in this area and recent excavations have allowed a better understanding of its location between the Foro Romano and Imperial Fora. It was attributed to Constantine by Nibby in 1825, but today it is named after Maxentius, Constantine's rival who almost completed it. The front of the Basilica was embellished with eight gigantic Corinthian columns, of which one is left and it is now opposite S. Maria Maggiore, where it was relocated by Paulus V in 1613. The colossal vaults and their decoration were a source of inspiration for many artists. The maps showing the expansion of the Roman Empire were added in the 1930s (there was also another map showing the short-lived Italian Empire which was declared by Mussolini after the conquest of Ethiopia in 1936). Chiesa di s. Maria in Campo Carleo, e quella di s. Urbano Due strade si aprono ai fianchi di questa piccola, e antica chiesa parrocchiale; una a destra dicesi; de' Conti, e l'altra a sinistra, si chiama Alessandrina.